I made these with leftover polenta that I didn’t want to throw away. When you think about all the food thrown away each year, it’s just unbelievable. I was reading an article on the French news stating that each French person throws away 79 kg (about 180 lbs) of food per year, which I find shocking, especially when you think about all those who are starving in the world due to no food supply. Germany has installed public refrigerators outside supermarkets where people can leave leftover food to fight this waste problem. I think more countries should follow Germany. 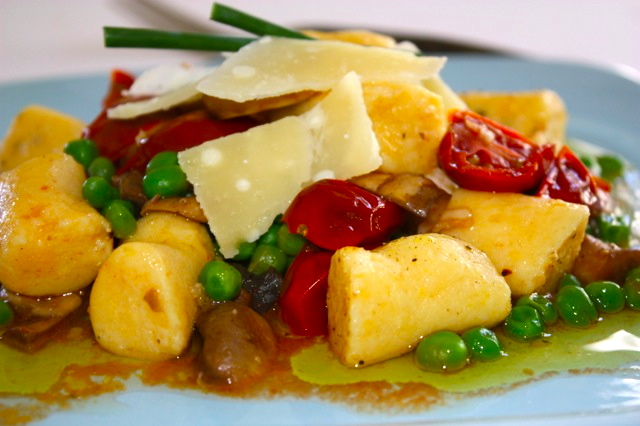 if you have no leftover, you will have to make polenta first. My polenta was flavored with rosemary and parmesan that I used to make little cakes to grill. I used express polenta, it will save a lot of time (boil water with 1 tbs chopped rosemary, stir well according to package directions, add parmesan at the end). If you are not using leftover polenta, that your are just making it fresh, it needs to cool down, preferably placed in the refrigerator until it becomes hard. I used gluten free flour, not because I have a problem with gluten but because I was out of regular flour. So use the flour of your choice, but not a strong flour like quinoa flour, or any other strong flour. 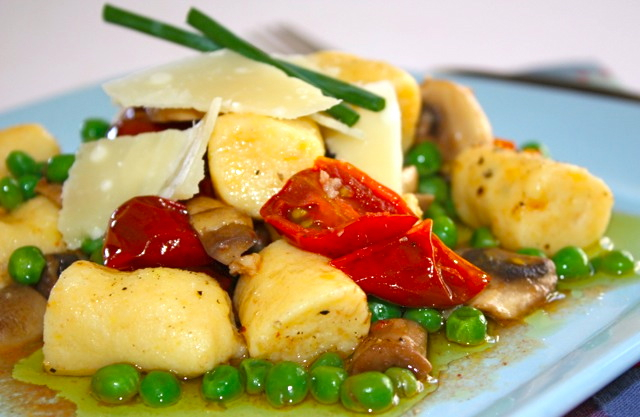 You need a mild flour or the gnocchi will taste too strong especially with the rosemary and parmesan in the dough. Heat olive oil in a pan. Add garlic and stir to get the flavor out. Add mushrooms and cook at medium heat until just cooked and water evaporated. Add tomatoes, and peas and cook until vegetables are soft but tomatoes not mushy. Adjust with salt and pepper. When the polenta is solid and hard, take out of the refrigerator, and using a rolling pin, crush it to crumble it to turn it into an homogenous grainy texture. Add egg and flour and mix well to obtain a dough. Take some dough and using your hand roll to form long cylinders (about 2/3 inches diameters) and cut into 1 inch long pieces. Bring a large pot of salted water to a boil, then add gnocchi. 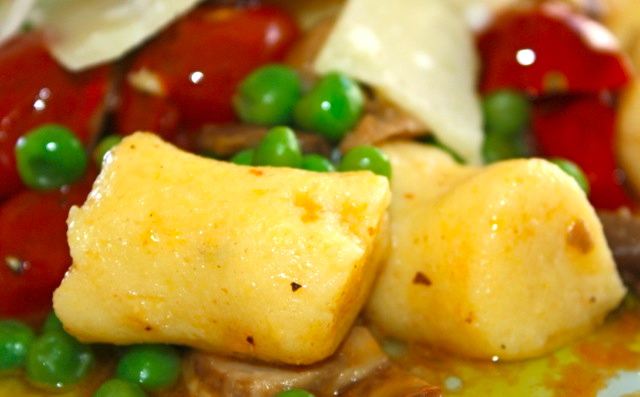 The gnocchi are cooked when they come back up at the surface. Drain and serve with sauce. Sprinkle with chives and olive oil and serve hot (you can also sprinkle some parmesan, but it’s optional since the gnocchi do have parmesan). This entry was posted by silvia on April 17, 2015 at 3:26 am, and is filed under Pasta, Vegetarian - dairy. Follow any responses to this post through RSS 2.0.You can leave a response or trackback from your own site.